When we enter a church building we are accustomed to seeing banners, stained glass (or not), icons and paintings (or not), and all sorts of visual clues that tell us about the people who gather there and what they believe. Behind all the more obvious visual elements, the architecture of the building itself is a powerful shaper of the faith and worship of the community. This is true of the worship space of St. Barnabas. Built in 1964, it was designed by architects Buderus & Sunshine. The church building received awards “for excellence in religious architecture” given by the American Society for Church Architecture. It is a fine example of a rather austere mid-century modern building, and at first glance contains few of the more obvious visual cues one expects in a church. Our worship space, however, is rich with symbolism. Its austerity and monastic feel invites all who enter into contemplation and prayer. The octagonal shape of the space means that worshippers see and share their experience with other members of the community. This is not a place where you can only see the backs of the heads in front of you. And, as each worshipper sits in quiet and contemplation they will begin to notice other images and symbols scattered here and there around the church. Come, let us start at the red doors and explore some of the symbols and images you will find at St. Barnabas. It is customary, especially in Episcopal Churches, to paint the doors red. The reason for this is obscure. There are several proposed explanations. The most mundane is that once upon a time painting the doors of a building red signified that the mortgage had been paid in full. Red doors also remind us of the Passover in which God commanded the Hebrews to mark their doors with sacrificial lamb’s blood to protect them from his judgment on the firstborn in the land of Egypt. For Christians this symbolizes the blood of Jesus “poured out for many for the forgiveness of sins” (Matthew 26:28). Red is liturgically significant. It represents the blood of the martyrs calling us to lives of self-sacrificial love and discipleship and faithful witness (martus in Greek) to the good news of Jesus Christ. Red also represents the fire of the Holy Spirit. When we enter the church we place our lives in the sphere of the gift-giving Spirit who births the church and comforts, strengthens, challenges, refines, and transforms us. The red doors of churches have traditionally indicated sanctuary refuge, safety, and hospitality. 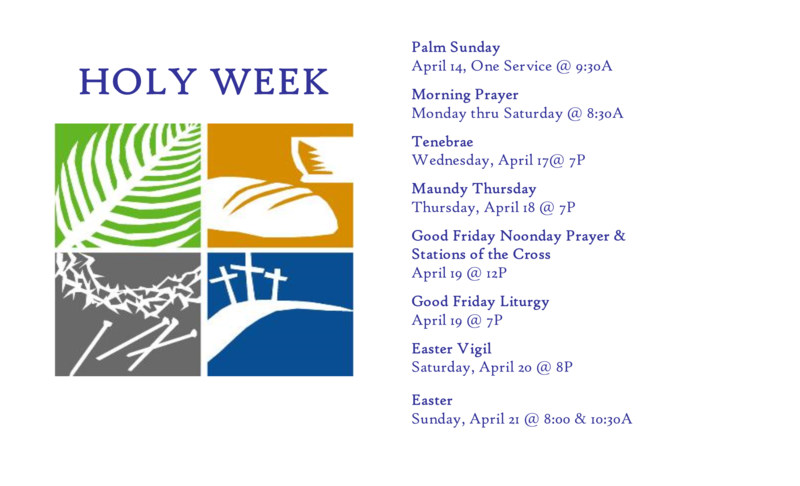 We hope you find all of these at St. Barnabas. 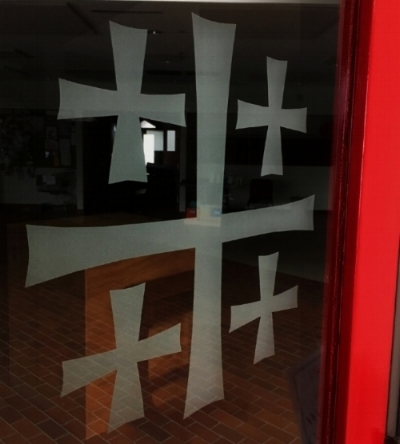 The windows of the doors leading into our worship space are etched with the Jerusalem Cross. The Jerusalem Cross was first used sometime around 1100 A.D. The design incorporates five Greek crosses. The larger central cross stands for the person of Christ and the four smaller crosses are the four Gospels proclaimed to the four corners of the earth, beginning in Jerusalem. Together, they symbolize our focus on Christ and our commitment to proclaiming his good news to the world. As we enter the church for worship the Jerusalem Cross on the doors reminds us that our worship here participates in the worship of the heavenly Jerusalem and that Christian hope is grounded in our citizenship in that City.